The DD-3 is a 12-bit digital delay with analog feedback and mixing stage. What this means is that everything in the pedal is analog, except the part that produces the actual delay. The analog signal is split, and a portion of it is sent to the delay chip (the rest ends up at the output stage, where it is joined with the delay signal). In the delay chip, the signal is slightly crudely converted into digital form (12 bits is not quite CD-quality, folks) and delayed. The delay chip then spits out an analog signal (delayed, of course), and a portion of that signal is sent back into the delay again (this is controlled by the feedback knob). So, for each pass the signal makes, it gets dirtier and dirtier, due to the repeated conversion process. The Boss DD-3 has been around for quite some time now, and people are starting to realize that it has changed somewhat over the years. Boss recognizes two different versions – the DD-3 and DD-3(A) – a definition that corresponds with a major change in the circuit design, where the schematic changed drastically. However, if we take a slightly more focused look at the DD-3, we find three distinctly different versions, with a fourth thrown in for good measure… But let’s start at the beginning, with the DD-2, the world’s first digital delay in compact pedal form. Boss released this pedal in 1983, and to say that it caused a stir is an understatement. Still, the technology involved was quite expensive, so it wasn’t a pedal everyone could afford. In 1985, they followed up with the DSD-2 Digital Sampler/Delay, which in essence is the same circuit as the DD-2, but with a sampler function thrown in. The DD-2 only has a ”hold” function, to replay the same sample over and over, while the DSD-2 got the additional ability to replay the sample on demand. In 1986, the price on the digital delay chip used in both the DD-2 and DSD-2 dropped dramatically, which meant that compact digital delays might now be affordable too. Rather than lower the price of the DD-2/DSD-2 (thus giving the impression that they were overpriced before), Boss decided to relaunch the pedals as the DD-3/DSD-3, with the new lower price and a minor facelift. So the DD-3 was born. The second output jack is now labeled ”direct out” instead of the ”stereo out”, but according to the user manuals, it works the same as before (2nd output is dry only, switching the main output to delay only). It had the ”external” type of adapter jack (the one that slides into a cutout in the box, rather than just poke through a square ”hole” as they do these days), and a blue label marked ”Made in Japan”. 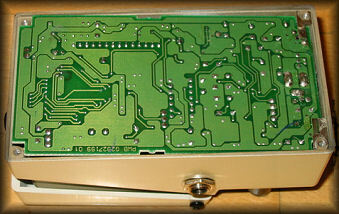 The mode selector was mounted separately from the other three pots (which were soldered together to a small circuit board). This means that if you find a DD-3 that has a wobbly mode selector while the other pots are screwed down tight, it is definitely a version 1 pedal. 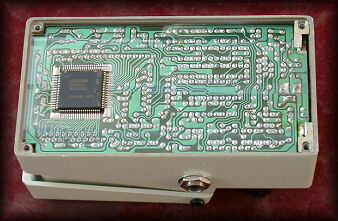 If you open it up, you will find a huge delay chip that covers the entire width of the circuit board, along with a maze of wires connecting the pots and various points on the pcb. It also has the same foil shield found in the ”2”. Eventually, Boss decided that the circuit design used in the DD-2 and early DD-3 was too expensive to manufacture – which is understandable, considering the amound of hand-wiring and tiny wires that went into one of those pedals. They completely redesigned the circuit board, to minimize the number of wires needed to be hand-soldered, and based the delay circuit around a completely new main delay chip. This new circuit was named DD-3(A) by Boss. When you open one of these pedals up, the circuit is easily recognized by the square delay chip that is soldered to the back of the circuit board. The plastic shield that is there to protect the soldering (back) side from shorting out on the bottom plate is cut out, to let the chip touch the bottom plate. These pedals had the external adapter jack, and most likely they all came with blue ”Made in Japan” labels. I’m not 100% sure about the label, though, so if you have a DD-3 with the external adapter jack and a Taiwan label, let me know. Somewhere down the line, Boss redesigned the top end of the circuit board to fit the more modern style internal (or pcb-mounted) adapter jack. 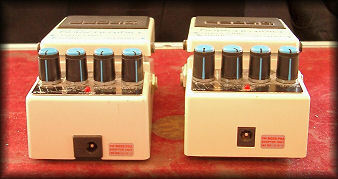 This change was made while the production was still located in Japan, so the earliest of these pedals will have the blue ”Made in Japan” label. At a later point in time, Boss moved the production to Taiwan, obviously changing the label as well. As far as I’ve been able to tell, the adapter jack is the only difference between versions 2a and 2b. Please note that Boss doesn’t officially recognize version 2a – according to them, all version 2 pedals (DD-3A) came with the ”internal” adapter jack. I am pretty sure I have seen version 2 pedals with the old-style ”external” jacks, though. This is the current version, and it is once again quite different from the earlier models. The service notes for this pedal have a header that says ”DD-3(T)”, although in the text it is referred to as the DD-3(B). The layout is drastically different from the earlier versions. 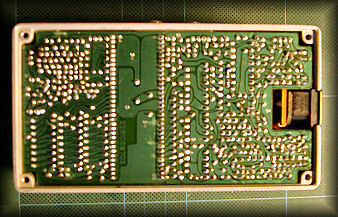 The circuit board is now double-sided and many components are the SMT micro-size type. This essentially means that there are circuit traces (the small ”wires” running along the back of a normal circuit board) on the front of the pcb as well, eliminating the need for connecting wires, and the surface-mounted (SMT) components take up a lot less space. This makes construction far easier and faster. Sadly, the pedal sounds quite a bit colder and more ”precise” than the earlier ones, so from a pure sound perspective, I definitely prefer the DD-2 and version 1 DD-3. However, with a couple of mods to take the treble edge off the delay sound, the version 3 DD-3 can sound pretty nice indeed. Also, thanks to Brian Magill for the pcb photo!